Sewing history in the fast lane. I realize this is a bit late for our recent civil holiday (in America) of Presidents’ Day, but nevertheless I will now share the outfit I made to wear for it…better late than never! America’s sweetheart and Captain America’s crush, Agent Peggy Carter of Marvel, was of course my go-to girl for inspiration here because when you stand behind the super soldier defending the freedoms of the stars and stripes, your wardrobe naturally ends up being very patriotic! As February is a short month, I am sneaking this post in between my dual posts on historical lingerie. 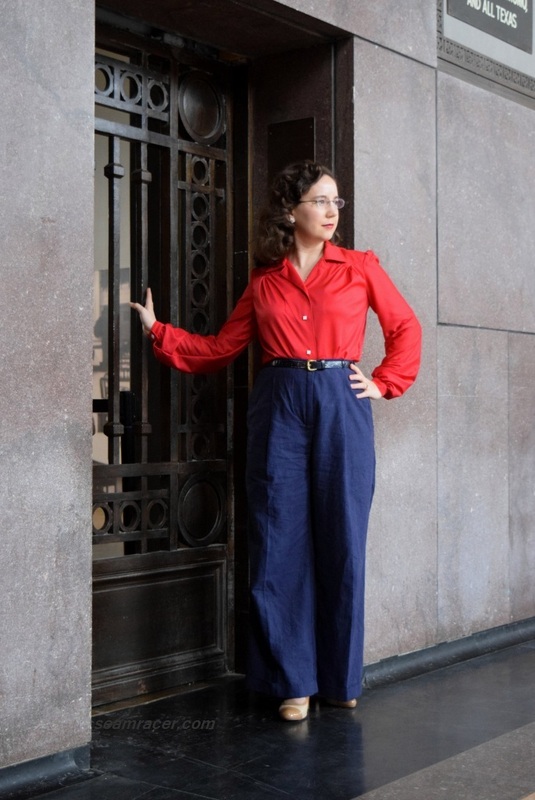 This outfit is part of my quest to have all of Peggy Carter’s wardrobe (as seen in both seasons of her TV series), as well as looking for something brightly patriotic, wonderfully 40’s era, and supremely comfy. You see, I wanted a special set with all of those qualities to wear during our traveling weekend, and a trip gave me a good reason to buck up and finish a Burda Style project for the month of February (meaning the pants)! I have been supplying myself with a nice and varied collection of trousers and pants, and this one is definitely another kind of ‘different’ to do – all baggy yet still tailored, and definitely vintage-inspired. The blouse half of my outfit satisfies my current “thing” for making tops, and it is sewn with a knit, which is both easy care and different, too, for my 1940s wardrobe. Also, it is made using a vintage Advance sewing pattern, a brand that is not seen as much, with leftover material from a past Agent Carter project of mine, for even more special connections. This outfit’s original inspiration can be seen on the Agent Carter television series by Marvel, specifically Season Two, Episode 5, “The Atomic Job”, when she breaks into a morgue to steal a body that holds the evidence her and her friends so desperately need, before things end up taking a much more dire turn. 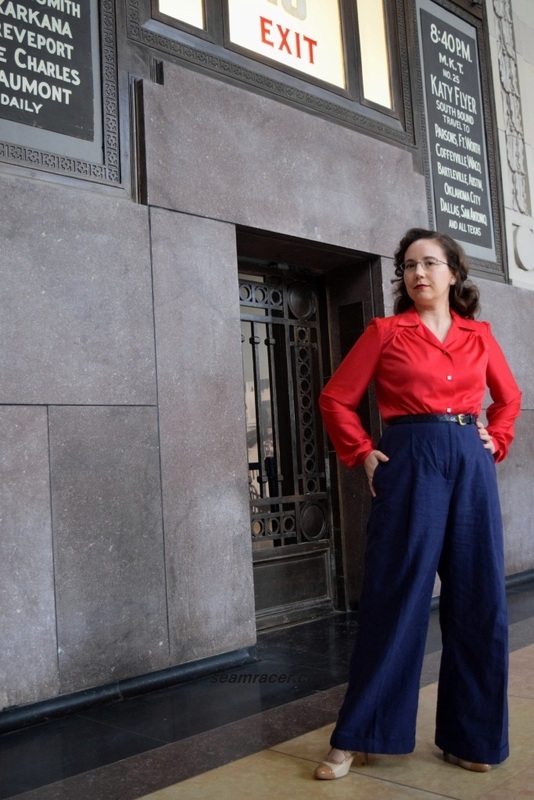 In our pictures, my version of Peggy Carter’s outfit is seen in the historic Union Station of Kansas City, Missouri, for a much less heavy reason – a destination trip to see some exhibits. 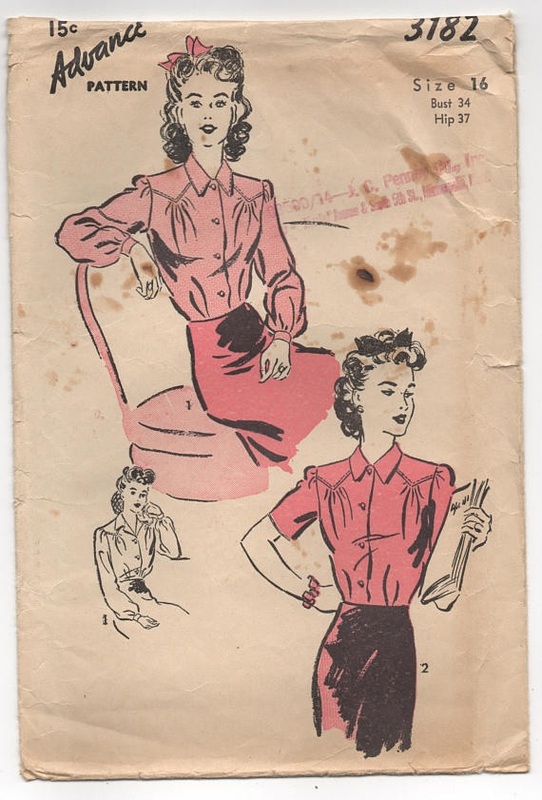 PATTERNS: A vintage original Advance #3182 pattern, circa 1941, was used for the blouse and a Burda Style #102 for the pants – view B is the “Marlene Trousers”, while view A is the “Button Tab Trousers”, both the same and both from September 2013. NOTIONS: I had all I needed on hand – thread, interfacing, bias tapes, hook-and-eyes, a metal jean style zipper, and vintage pearl buttons. TIME TO COMPLETE: The pants took about 20 to 30 hours of time to finish on January 17, 2018. The blouse came together in about 10 hours and was done on February 14, 2018. THE INSIDES: The pants are as professional as I could make them – all tiny but fun bright red bias bound edges. The blouse’s material doesn’t fray so it is left raw to make my work easy for a change! This set was a wonderful mix of sewing things I’m used to, with an added element of difficulty. I’ve sewn many pants and trousers by now, but this pair was labor intensive and required dedication to finish. I do feel it brought some of my skills to the next level and perfected others. This was by far the most challenging Burda pattern I’ve tackled yet, besides this coat, but it’s so worth when it comes to what I end up with having! The blouse was not far off from any other traditional blouse, but the fine, lightweight material in a knit made it slightly tricky to sew, besides the fact it has very unusual front shoulder panels. 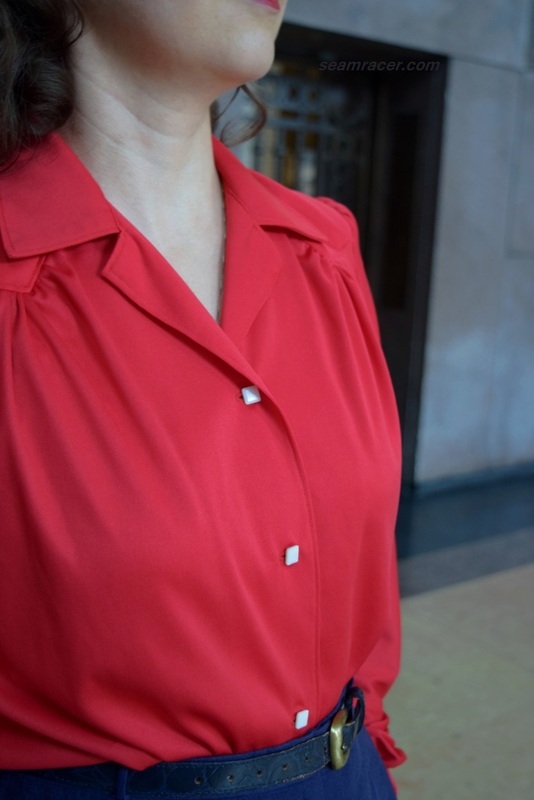 I splurged on this blouse and used some prized vintage notions from my stash, just to be close to the inspiration Agent Carter blouse, with its pearled square buttons, so this was an added special touch a bit out of the ordinary from my “normal” sewing. Both patterns had their aura of mystery when it came to getting them to fit. The blouse was a vintage unprinted pattern, marked with a code of dots, but as I have done so many of these by now, it was no problem to cut and it fits beautifully. Yet, I was dubious about the pattern because every time before this I have sewn with an old Advance pattern, they have run small in size. Thus, for this pattern, it is happily a size too big for me already, and it fits. With the knit fabric, I actually could have brought the blouse in a bit, but I’d much prefer a bit generous than too small. For the trousers, I realized (correctly) that they probably run a bit big due to the generous silhouette and wide legs. However, I figured it’s easier to take a garment in than work with it when it’s way too small, so I stuck with my “normal” size that I always tend to make in Burda Style. Yes, the trousers do run big and I probably could have went down a size, after all. However, because of the way these pants are finished in the back center waistband, sewn up there as the last step (very similarly to menswear, actually), these were easy to take in an extra bit for a size that is better than they could have been, not as good as I would like. These are so comfy being roomy, and I do love the style, so I can’t really complain with all that much energy! Perfection in an art (and I include sewing under an art form) is relative to one’s contentment with one’s work and the either unknowing or appreciative eye of the beholder. Both pieces turned out great and taught me more than I knew before. There’s something good achieved, beyond the fact I have another Agent Carter set! Squee! Now, as for any Burda Style pattern, printing and/or tracing is necessary to have a usable pattern to lay on your desired fabric. My pattern was traced from the downloaded and assembled PDF bought at the online store but if you have a magazine issue, use a roll of medical paper to trace your pieces from the insert sheet. It’s at this preliminary step that I pick out my chosen size and add in your choice of seam allowance width (I normally add in 5/8 inch allowance), but others do this directly on the fabric as they are cutting out. A scissor with a magnetic ruler guide attached helps immensely for adding on the seam allowance easily. Sorry to repeat something you might already know, but this is just an “FYI” for those that don’t. Burda patterns do frequently get the bad rap of having terrible instructions (they’re words only), but I did find these to be quite good…except when it came to the front fly and its self-placket. I was lost, but that was okay. I looked at my husband’s existing pants, and remembered the last trouser fly I had made, and sewed it how it made sense and was practical. You know what? These turned out great. 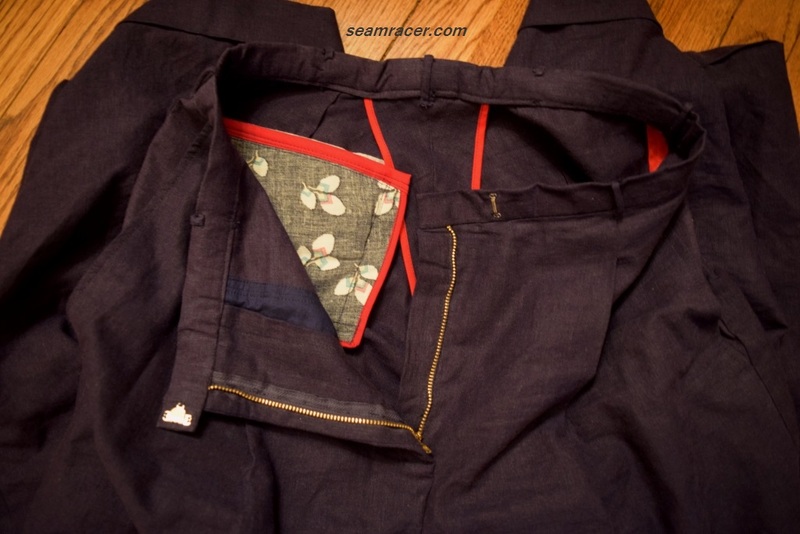 The side pockets smartly have a panel extension that continues towards the middle to connect (inside at the facing) with the zipper fly. This is a wonderful detail that helps out taming the front pleats, but made it confusing to sew. It did turn out a very smooth and flawless inner waist and tummy area this way. The side pockets stay nicely in place and balance out the bulk of the fly by those extensions pulling it in. I did a lot of invisible hand-stitching, though, to make sure the front fly looked quite nice. The welt pockets – to me – are actually the best part to the pants, even though I detest sewing them and find them exhausting to make. There’s something about cutting into the middle of a perfectly good garment that makes me doubt my capabilities. One welt pocket took me just over two hours to complete…but I’m so much happier with it than my last attempt! The instructions for the welt, and its markings were right on and helpful. I wasn’t sure if I really wanted the pocket flap, but now, most of the time, I keep it tucked into pocket. If I ever feel like wearing it out of the pocket more, I might feel obliged to stitch on a button and buttonhole to keep it down, like the instructions recommend. I did add plenty more belt loops than the pattern called for, mostly because my pants (as I said) are still a bit too big on me. The more belt carriers, the better the trousers stay up, for there is a darn lot of fabric here to wear anyway! The side tabs on the waistband were left out in lieu of the extra belt loops. I fear that the wrinkling in the waist and back pants legs are not due only to the properties of the linen material, but also from the fact that the waist buckles a bit from bringing it in under the belt. 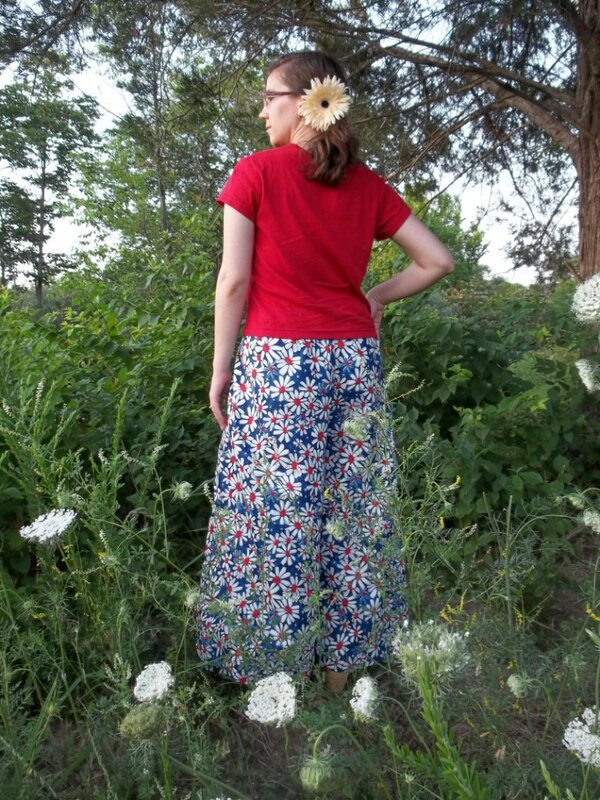 The complete indulgence in excess fabric to these pants make them very much like pre-WWII menswear styles for women. Burda aptly labels them “Marlene Trousers” after the woman that channeled her own taste for the masculine-feminine dressing for the empowerment of others to do the same in the face of society – Marlene Dietrich. She certainly started something when she appeared on January 12, 1932 at the opening of The Sign of the Cross movie, wearing a masculine tuxedo, wing collar, soft felt hat, mannish topcoat, and a pair of men’s’ patent leather shoes! Dietrich, who had been wearing trousers publicly as early as 1929, and Greta Garbo were the 1930s pioneers for menswear styles for women. Yet, “I wear them to be comfortable,” Dietrich is quoted as saying, “not sensational!” 1930s ladies’ menswear borrowed heavily from what guys were wearing especially when the materials were woolens and other suiting, but women also found their own interpretation in the super-wide legged, flowing beach pyjamas of summer and resort scenes, skirt-like Singapore trousers, and other unique interpretations of bifurcated bottoms. These were also, no doubt, part of the luxury that was the mindset of the 1930’s, especially for Depression times. Fashion counter-reflected what society was really going through, so from the boom of bling with costume jewelry to the luxurious evening gowns, the trousers, too, had every added feature that used as much extra fabric as possible – cuffs, deep pleats, and generous pockets. Check, check, and check…these Burda pants have all that aplenty! My own pants are somewhat a mix of the heavy men’s suit style with a little female influence with the lighter weight linen blend, non-suiting material. This is a kind of trouser style that could have been worn throughout the 1930s and well into the early 1940’s. This pattern definitely deserves to be included in my ongoing post series, “Retro Forward with Burda Style”. A good pleated pant of this style is hard to find. Vintage pants were always ironed, or sometimes even stitched, with center front and back pleats on each leg. 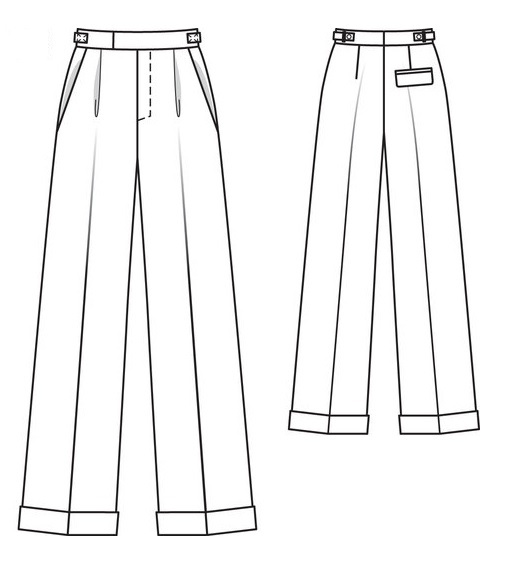 Most pants that I see nowadays which attempt this “look” end up fitting so tightly past the hips there is no point in having a vertical running pleat, it cannot continue down due to the tight fit in the thighs and below. Now, I know my pants do not show as crisp a pleat as I would have liked, but it is there and they can hold it quite well when I am not traveling in them. Nevertheless, these pictures show the reality of my pants being used and worn for real living, well-traveled in and time tested…and I think they prove themselves quite well, especially for being linen-rayon! (See? You can travel in and wear linen!) 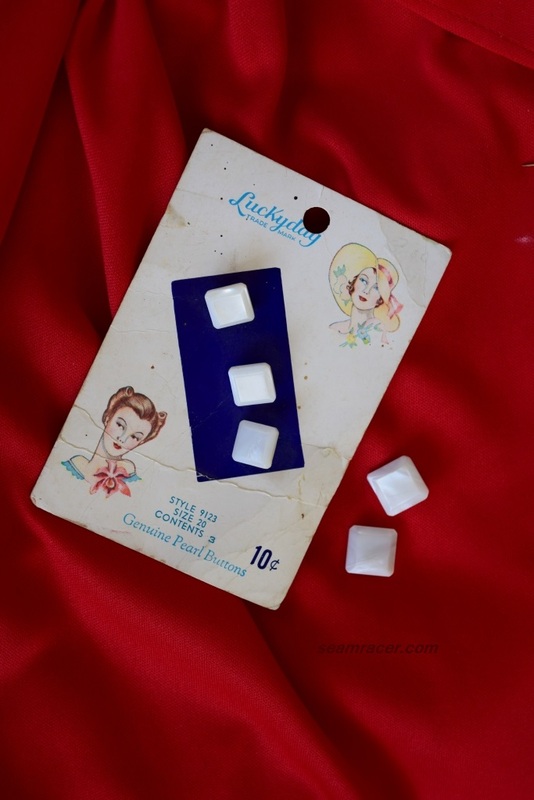 I’m really surprised that bloggers and seamstresses in the vintage community haven’t discovered these after all the 5 years this pattern have been out. These are like rare gold! To match with the whole pre-WWII style, my blouse is from 1941, before America had been completely committed to the war effort. Besides, Agent Carter herself was a woman stuck in the past, due in no small part to her fond yet painful memories of both knowing and losing Captain America. These were two of the reasons for using this particular Advance pattern. I know it is not exactly alike to the inspiration garment, but it is perfectly her style as she has a penchant for blouses with small yet stunning and beautiful details, whether it’s in the top-stitching or design lines. This one certainly fits the bill with its special pointed front shoulder panels, square buttons, silky finish, and menswear-style back shoulder panel. It’s simple at first glance, yet more complicated the further one looks. This is one of the few blouses I have made that has this much all over gathering…here, there, everywhere! Most of the times I use menswear inspired, professional-style pleats in the sleeves nowadays, but this flowing feminine fabric deserved a departure from my norm. Yet, there is one more detail that deserves to be told. The front buttons came from one set that was bought (intact on a lovely decorative card), while the other two for the cuffs are a size bigger, from a pair that were in the stash of hubby’s Grandmother. Not too often have I come across two separate vintage button sets that actually match up with one another. Button serendipity sometimes does happen. Both of the bottoms and top are made from various leftovers, as I mentioned above. Besides the whole “reduce-and-reuse” sensibility of it, and the way it whittles down my ever growing fabric stash, I do like how the connection with the previous outfits these fabrics went towards is perfect for a new Agent Carter set. 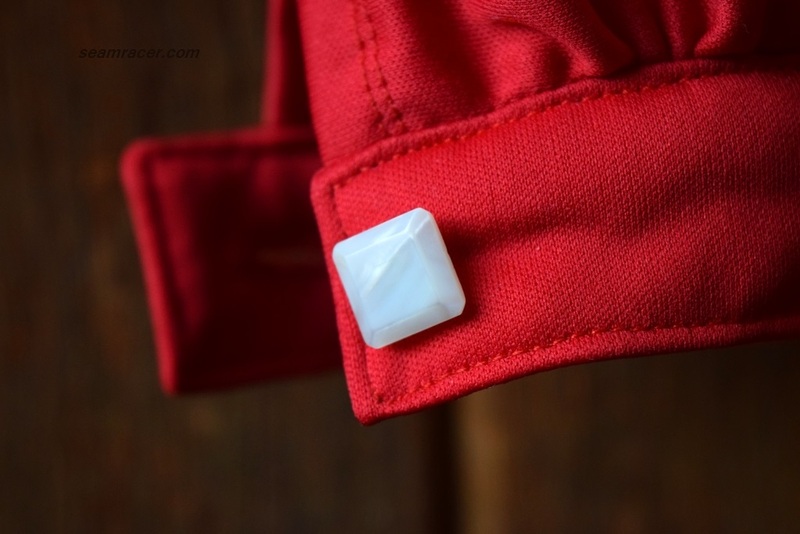 The Agent Carter dress re-fashion from exactly one year ago had just enough left over to make this post’s blouse, bringing together two of my Peggy creations. 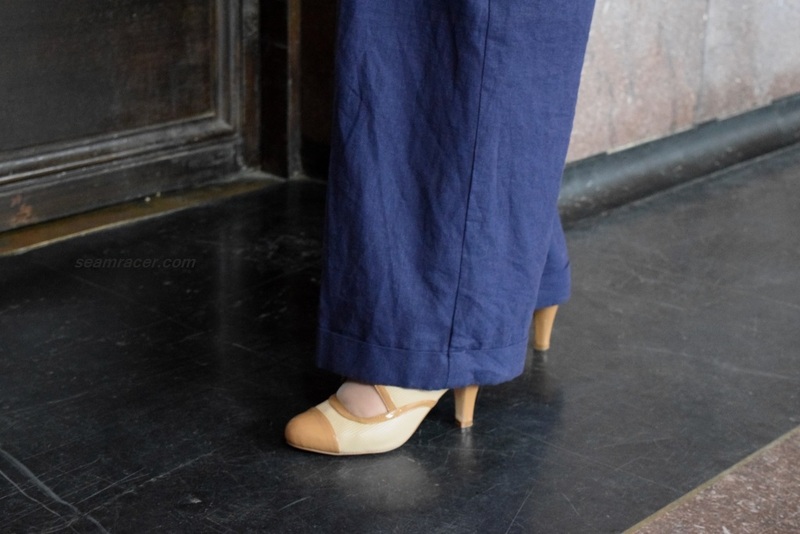 The linen of the pants is the same material as my 1905 Walking Skirt, the first power separate, much like 1930s and 40’s trousers, from an earlier era for a self-reliant, independent, and active woman. 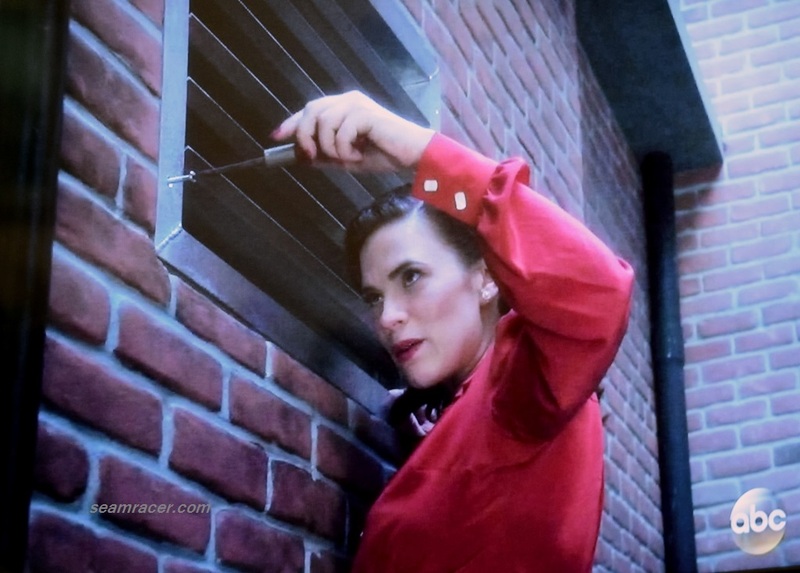 After all, Hayley Atwell, the actress who plays Peggy Carter, also plays a similar character led by both her heart and mind in another television ministry taking place around the turn of the century, “Howard’s End”. The small, almost worthless leftovers from my 60’s wrap dress became novelty pockets in my pants. It would just be like Peggy, who had a photographic memory for detail and the mind of a true government agent, to remember some little scraps to hide a secret in her clothes. Now if it really was Peggy wearing these, there would be some coded message or handy tool inside my pockets as well! Contrast pocket fabric is a fun, personal touch that only I really know about (well, not anymore!) but just knowing it makes me smile inside! It’s these little personal touches in one’s sewing, especially when it’s not something publicly noticed, that makes one’s work a very individual art. Using up every bit of what you have and having all of your projects go to ‘help’ out other projects, can make you proud and feel like you are doing something bigger than yourself (and you are!) by making your own clothes. Be like Marlene Dietrich (or Agent Carter) and wear what you want, without fear of judgment or scrutiny. There is no better way to do that today than sewing one’s own clothes or even buying second hand, whether vintage or not. I for one feel my best self in something vintage, and/or handmade, and especially Agent Carter related. You know, there is almost nothing more lovely and catching than the self-confidence that comes of being assertive in who you are and the clothes you are wearing! Find that sweet spot and change the world. When I think of the crossover time between the decades of the 1960’s and 1970’s, what tends to come to my mind are the classic historical features for the time – “flower children”, the “Space Age”, “peace and love”, calls for freedom, and (in fashion) loose, flowing, romanticized dressing in all man-made materials. 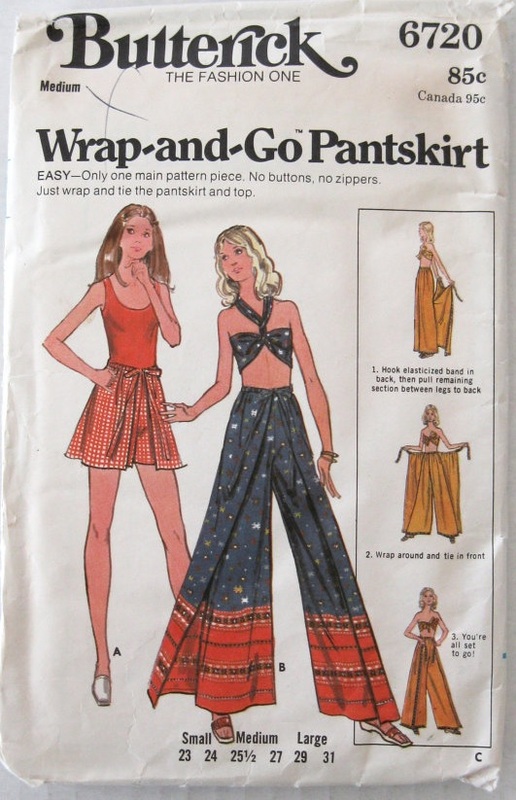 I hate stereotypes for history, but in this post I will combine all of them into one new, different, and amazing project from 1972 – the “Wrap-and-Go Pantskirt”. By the way, my top is not handmade, only the bottoms. My red star studded top is an oldie but goodie that finds its way out of the closet every year’s Independence weekend in July. NOTIONS: I needed none to buy, but all that is needed is thread, a small cut of elastic, a hook-and-eye, and about a yard of ribbon. 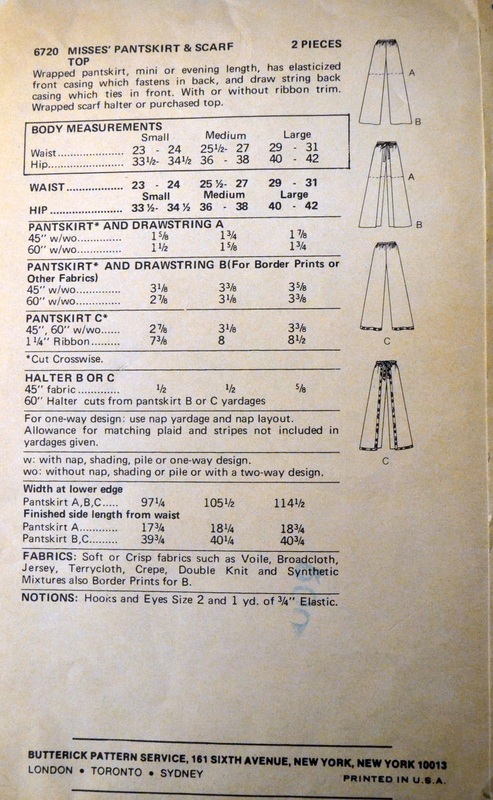 PATTERN: Butterick 6720, year 1972. As far as I can tell, this pattern was perhaps released originally in 1971, but for one reason or another, it was re-released 1972 with a different cover to the envelope. TIME TO COMPLETE: I only spent about 2 1/2 hours to do my finishing, but I can’t imagine it taking too long for my mother-in-law to do her part of the pants (I’ll explain more of this later). What takes the longest about making these pants is the large amount of fabric that is close to being a single cut. 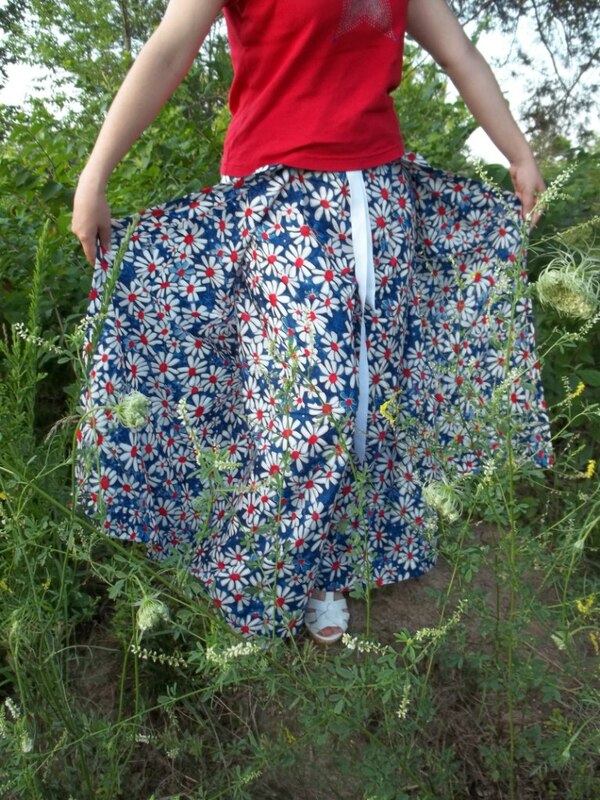 My new Pantskirt was finished in mid-June of this year, 2015. 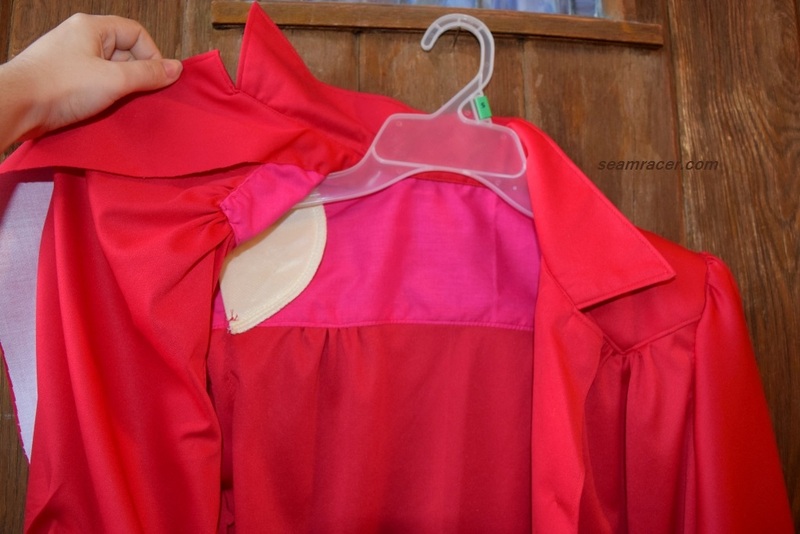 THE INSIDES: This polyester does not fray, and the whole garment is supposed to be loose and flowing, so the edges are appropriately left raw. TOTAL COST: Zero for me. I will explain the reason why in the paragraph below. Just to estimate fabric amounts, the pattern does calls for about 3 yards for the long ankle length version, and about 1 5/8 for the short version. This project is most unique in the way it is really a combined family effort. My mother-in-law recently hauled out her fabric stash for me to go through. Digging around in the boxes of fabric scraps one night led me to find what I thought was a large cut of classic 70’s polyester in an even more classic bright and floral print. When I opened it up…hello! It was actually a half-finished project. 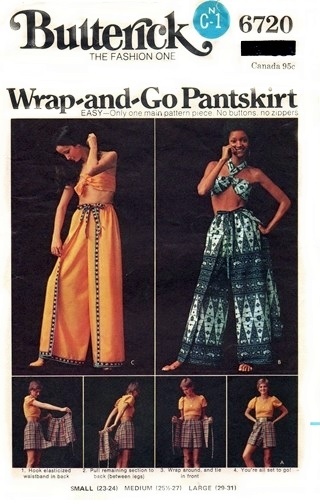 I immediately recognized it as the “Wrap-and-Go Pantskirt” and my mother-in-law recognized it as a project she set down years ago. 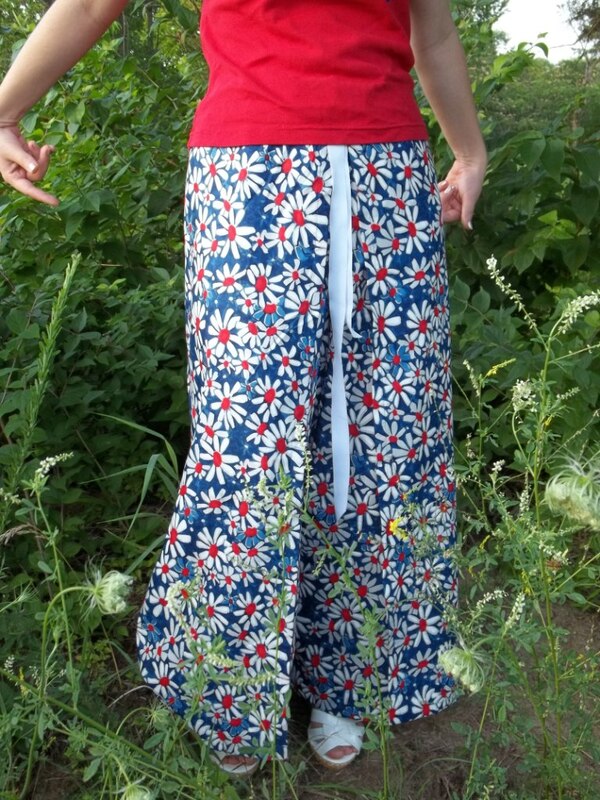 The only reason I knew about such an unusual piece was because just the week before I had intended on buying the pattern for the wrap pants, only to pass them up and consider buying at another time. In lieu of buying the pattern, I was overly recompensed and excited by my mother-in-law letting me have the pants to finish and wear. The pants had been pretty close to being finished when I received them. The crotch seam was stitched closely and clipped well, making for a nice and stable support for the whole project (just lettin’ you know she did a nice job). The back half of the waistband had also been completed, with elastic in the casing and a large hook and eye to close at the back. All I really had to do was a few things to make the pants wearable. I hemmed the bottom up 4 whole inches, I brought in the back waistband elastic to make it tighter, and ran a grosgrain ribbon along the front waistband casing. The last thing the project needed was a really good overall ironing job to get out the creases set into the fabric from a few decades of being folded and smashed in a box. Now, In case you don’t understand the simple creativity of the pattern, below I will layout the creative process that is “getting dressed” in the “Wrap-and-Go Pantskirt”. First, you find the back elastic waistband and hook that closed behind you with the crotch seam raw edge facing in against your skin. The rest of the garment is either on the floor or, if you hold the front waistband, in front of you. Your back half has an open slit flapping in the breeze below where it’s hooked closed. Then, in order to wrap it around you, find the front and the crotch seam, and put these through and between your legs towards the back of you. Now your front half looks like pants but the behind is still open. Finally, the front waistband is wrapped around from the back and tied together in the front middle. I adjust the gathers along the ribbon belt so that most of the fullness is towards the back because I like the behind to have extra room and my belly to look flat (who doesn’t). That’s it! When worn, these pants remind me of a pair of 1930’s beach pajama bottoms. They are wonderful in every way imaginable. The only way they could possibly be better would be if they weren’t in 70’s polyester…but then they wouldn’t be 70’s pants, would they? The wrap part to the front also sort of flies open as one walks making the pants feel so very elegant and comfy, even in the heat of summer. 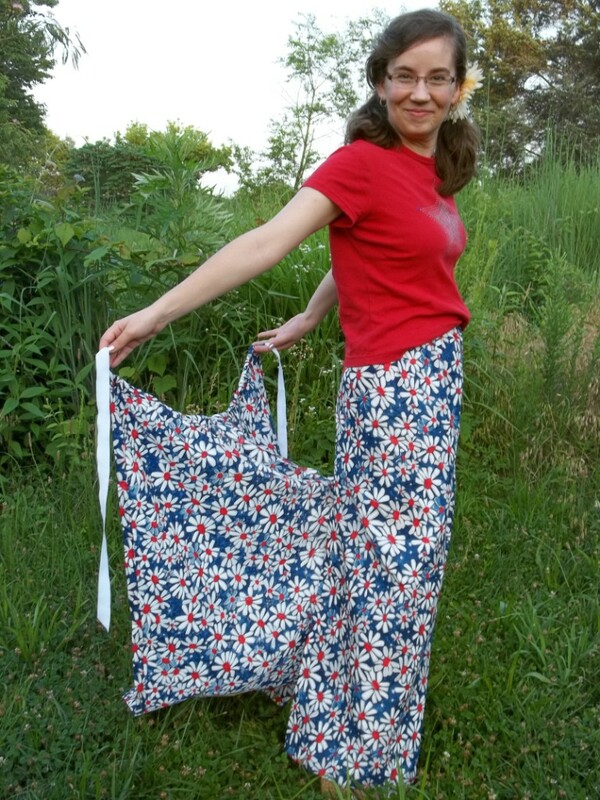 For beginners wanting to make pants, I would think the “Wrap-and-Go Pantskirt” would be perfect because it is a wrap, and there is forgiveness in the fit and design which doesn’t require perfect tailoring. Minimal sewing and only one real seam make this pattern super easy for the novice seamstress (or one who wants a simple project) while still seeming complicated on account of the style’s design. Tricky thing! What more could I ask for but more reasons to wear these out and about. However, when nature calls, it is even more of a creative process to try to go use the facilities in a public place without picking up everything disgusting off of the floor and back onto yourself. For this photo shoot, I couldn’t really show you how the project goes on very well in any public place, and there is too much fabric with not enough light to take pictures inside. 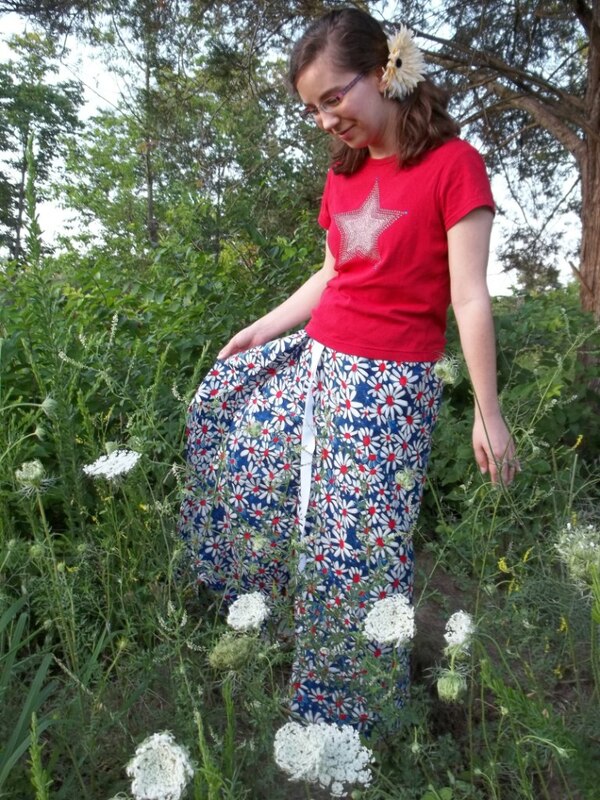 So, to go with the whole “hippie” and “flower child” idea and give me people-free room to partially undress, we shot our pictures in a field (forest out cropping) filled with Queen Anne’s Lace flowers. Little did I know that demonstrating the Pantskirt would also scoop up a generous amount of pests – skin sucking Chiggers, as a matter of fact. The pictures are perfectly what we hoped for, but, oh…was I stupid. 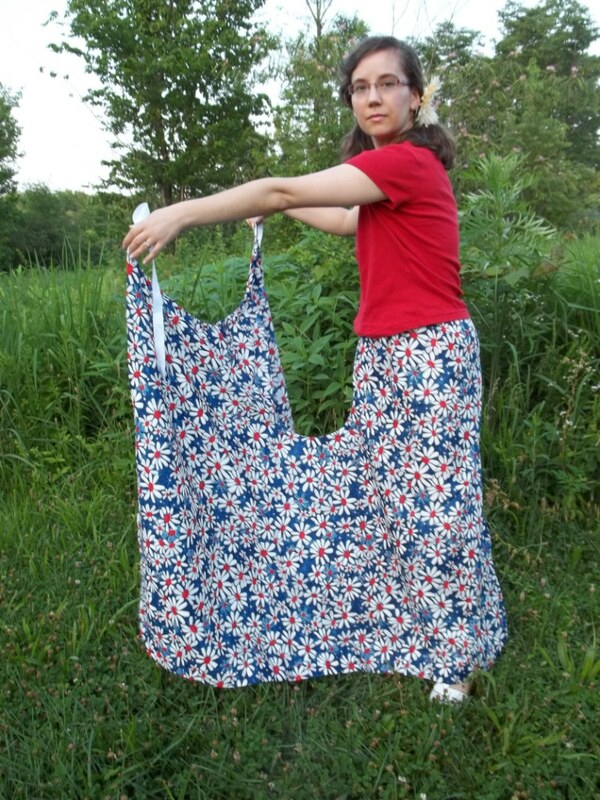 Sweeping the Pantskirt open then wrapping it closed in a field was equal to laying out a buffet right in front of the pests, then tucking them in so they’re nice and comfy to stay awhile. I am still scarred from their generous bites and I itched for a week. The things I do for a good picture! Freedom, peace, flowers (and bugs) all seem to have their time together when mid-year kicks in! I am missing out on the skimpy wrap bandeau top by not having the “Wrap-and-Go” pattern, but the same thing can be achieved with a large square scarf. I will be having a post about vintage inspired scarf ideas, showing the various ways a large 36 inch square was worn from the 1920’s to 1950’s, and a bandeau top like on Butterick 6720 will be in there. Knowing that freedom is celebrated in many countries in the beginning of July, here’s hoping everyone had (or will have) a safe and happy Independence celebration. Hi! I'm Kelly. Welcome to my 'home' on the web. One of my goals here is to document making a creative sewing project from each year between 1920 up to the 1970's, with a little modern, historical, and whatever strikes my fancy in between. I try to make a project a week (have been since 2012), so watch for frequent new postings. Thanks for visiting. A community for Dachshund lovers!